Rose Cottage01943 604321fax Self-cateringBeautifully situated in a small village, this pretty 18th century cottage has fabulous views and location to match. Decorated and furnished to a high standard the cottage; with beams, mullion windows and open fire has charm and character, there are two double bedrooms - a master bedroom with cream victorian stylemetal painted bed and a smaller pretty double. A log and coal fire is set between the dining and living room and in the warmer months a private south facing patio provides perfect al fresco dining. The light modern kitchen leads onto the patio and overlooks the Wharfe Valley.Lying midway between Ilkley and Bolton Abbey in the lovely village of Nesfield,the cottage is well positioned for many activities including Ilkley Golf Course just minutes away, in addition to horseriding and fishing. 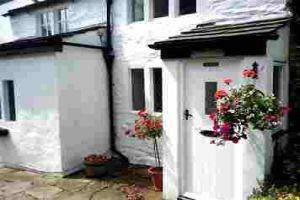 Enjoy Ilkley and the Yorkshire Dales with door to door walks from the cottage. Suitable for walkers - good door to door walks. Cycle lock up available. Children welcome from any age. From Leeds/Otley, A65 to Ilkley, turn right at the main lights (to river), then 1st left. Continue on Denton Road, then Nesfield Road to Nesfield. First right to village green, keep left, cottage is 200yds on the left. Train or bus to Ilkley, then take a taxi from the rank around the corner on Brook Street (approx £6.00).